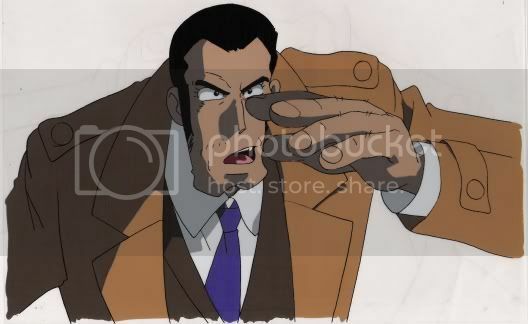 I bought this Zenigata cel a while back. I was wondering if anyone knew which anime it was from. my guess is that it's from missed by a dollar or island of assassins. the style of drawing is closest to those. and they're serving, like...chicken... in a pan...with some... salad...and a... glass of milk? To drink? You're right, it was Missed by a Dollar; Zenigata trying to talk his way out of jail. Thanks. I didn't want to have to go through my whole collection.